What could be better than a relaxing and guided cycle tour along the Brisbane waterways, across our beautiful bridges, through our gardens and green spaces, viewing some of the artwork dotted all over the city, while discovering the stories of their beginnings. 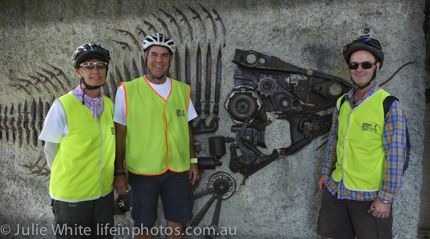 This makes for a fabulous way to discover Brisbane whether you are a local or a visitor and with this idea in mind 'Brisbane Bicycle Tours' was formed by two cycle touring enthusiasts, Steve and Fiona. 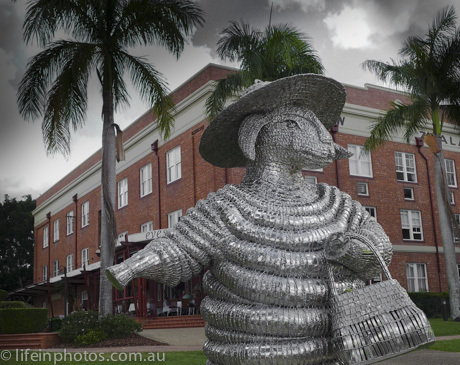 As your 'knowledge guides', you'll learn from them all sorts of interesting titbits about Brisbane and some historical moments, many even locals would be unaware of. 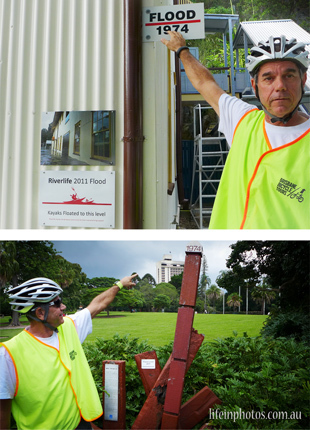 Highlighted on tour will be things such as the Brisbane Flood level indicators, that are placed around the city in various locations And have you ever seen the cute Bunny door in the trunk of one of Brisbane's trees? 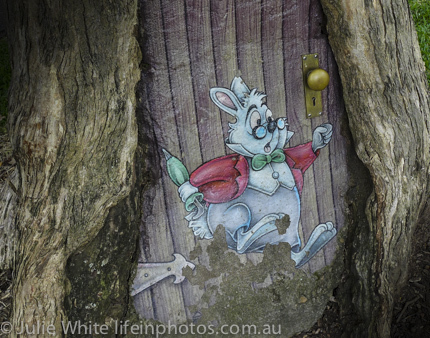 Where is this Bunny Door? Steve and Fiona are good company and they are happy to cater to your requests for when you would like to stop along the way to grab a photo, ask a question or take a rest break. You can ride for 2 hours, 4 hours or by a customised arrangement. I found the bicycles extremely comfortable and the gears easy to operate, so that just leaves you to enjoy your ride. My tour choice was the River City Ride and I had the most pleasurable time rediscovering the city on these easy wheels. The bicycle paths in Brisbane are extensive and safe to ride along, except where you may cross a road or travel down a back street - you will be travelling along the path. 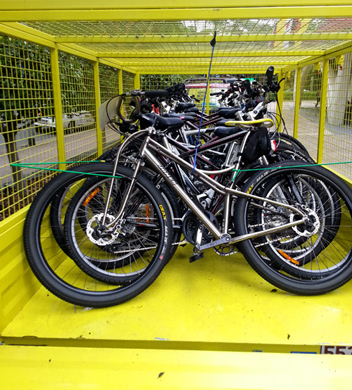 Your Tour Style can be customised to whatever you like and and is a great way for you and a group of friends to spend some time absorbing the 'best of Brisbane by bike'. Gather your own group together for a 'Girl's Day Out' on bikes, visiting friends and relatives, club members or your shift workers on a day off. For businesses, think about getting some of your staff cycling. These guided rides are great for team bonding exercises, incentive tours for rewarding efforts or just to organise for a 'great day out'. 1: You cover more of the city than you would by foot. 2: It's relaxing, easy and interesting. 3; You stop for coffee along the way. 4; It's the 'great outdoors'. 6: You'll be left feeling invigorated. New tour ideas are constantly being evolved so stay tuned in for some 'tours with a twist'. 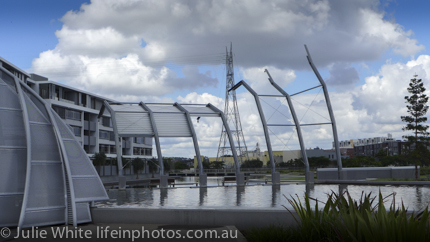 Want to discover more than central Brisbane? Great news is that Steve and Fiona are equipped to travel with their bikes. This means that for you and your friends or for your staff if you are a business you can even choose your own cycling destination. Perhaps an esplanade ride from Sandgate to Scarborough could be of interest to you. Talk to Steve and Fiona they will make the plans easy for you. It's all flexible, fun and worthwhile. The only thing left is to 'get out there and put your bum on a bike' with a friend or a few and head off with this 'special offer' for WeekendNotes readers. 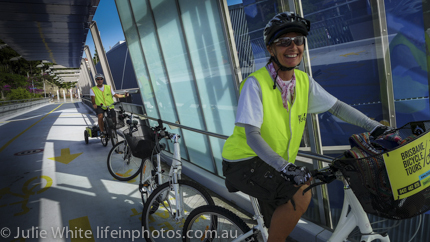 2 hour Brisbane by Bike tour , $40 per person, minimum 2 people per booking (normally $50 per person). Available for the first 100 bookings. TO BOOK with this offer. Want to ride for longer? 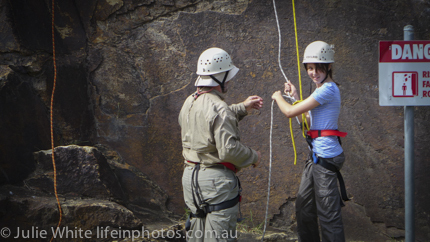 Simply provide the code, the tour choice and length of time you would like to arrange with your friends. Steve and Fiona will negotiate a special arrangement for you. 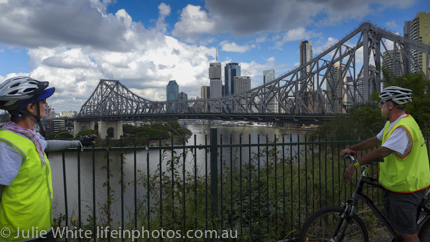 Refer to Brisbane Bicycle Tours website or Facebook page for more information.